This was another recipe that I just sorta made up as I went along. For whatever reason, I had an overwhelming desire to make pastry cream for the first time. So I did. Then I had to decide what I was going to do with it. Fast forward a couple days (yes, days) and I saw this cool picture (attached to a different pastry cream recipe) and it looked awesome. So I decided to recreate it in my own special way. Hence the pastry-cookies. In a heat-proof bowl, mix together the sugar, flour, and salt. Add in the egg yolks and mix thoroughly. In a small saucepan, heat the milk until little bubbles are forming around the edges. Remove from heat and slowly mix it with the egg-sugar-flour mixture in the bowl, stirring constantly. Once you’ve finished that, pour the all of it back into the saucepan. Reheat and stir constantly as it thickens. Once thick, let the cream boil for 10-15 seconds. Remove from heat and stir in the vanilla. Cover and stick it in the fridge to cool for several hours-a couple days. Measure flour and salt into a bowl. Using a pastry cutter or a fork, cut in the butter until there are no significant sized lumps. If compressed, the dough should almost be able to stick together. Add water, a little at a time, until the dough comes together. The dough should be soft and pliable, but cohesive and not sticky. Cover with plastic wrap and set aside. Mix the chocolate chips into the pastry cream. Roll out the pastry dough, and cut out smallish circles. You can use a biscuit cutter, but I use one of my small glass bowls. Stick a plop of cream in the center of each circle. 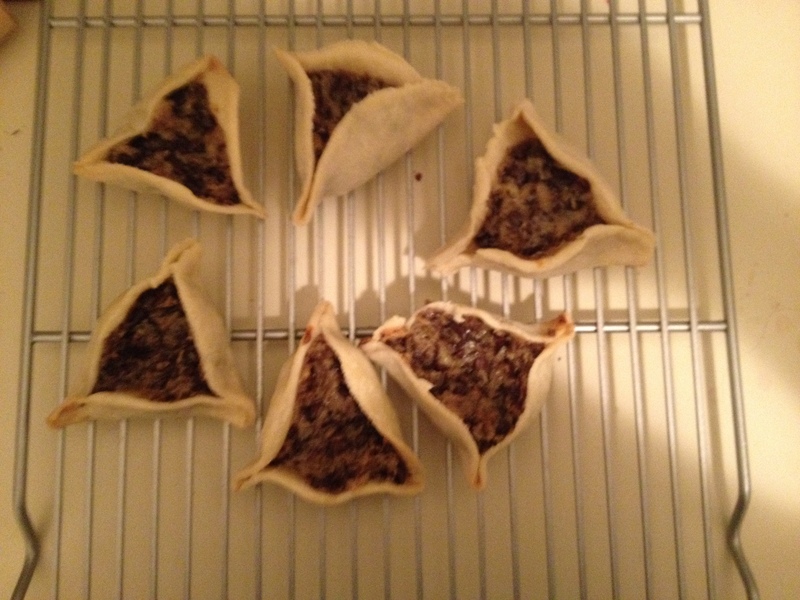 Fold up the edges of the pastry so that it forms a sort-of triangle. Still on a cookie sheet and bake at 350 for 15-20/the cookies start to brown. Oh my god, so good. One of my friends tried them with me and she really liked them too! They are particularly good warm and gooey fresh from the oven, but I froze the leftovers, and they were good like that too. They are half pastry and half cookie, so I call them pastry-cookies (ok, if you think of a better name please let me know). To be fair, they are kinda chocolate-chip hamantaschen. These are great on their own, but I think they could go with tea. Song of the week: Just Like Heaven, by the Cure. Oh how I love this song.